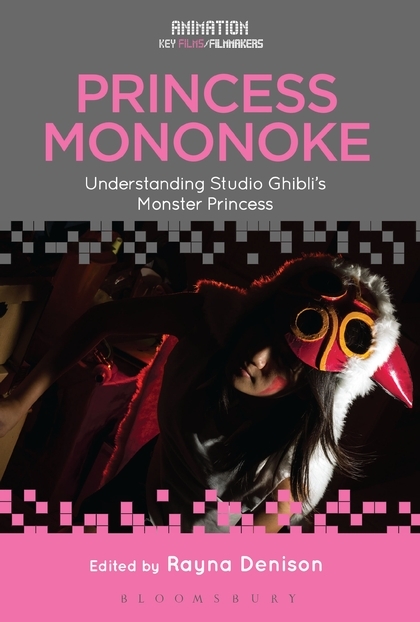 Fittingly for a twentieth anniversary collection of essays on a single, much-loved film, Rayna Denison’s just-published Princess Mononoke: Understanding Studio Ghibli’s Monster Princess (Bloomsbury) throws in everything but the kitchen sink. In the sense that it went mainstream and has been the focus of widespread appreciation, Princess Mononoke has generated a vast amount of secondary materials. Through critical acclaim, corporate backing and foreign sales, Hayao Miyazaki remains the best-represented anime director in translation in his own words, which boosts him in terms of scholarly access – it’s not only easier to sell a Miyazaki book to publishers, but also to readers and even contributors. And this is an impressive bunch of contributors, featuring some of the sharpest minds working on anime today. Shiro Yoshioka examines the position of Princess Mononoke within Miyazaki’s work, noting that is very success may have forced him into a compromising niche, turning him from an action director into an eco-pundit. Eija Niskanen pokes around Japanese archaeological sites in search not only of Miyazaki’s inspirations, but the gaps in knowledge that he imaginatively filled with his own designs and ideas, noting in the process that the film defies traditional notions of what a “period film” should be like – a samurai movie with no samurai in it, showcasing the also-rans of Japanese history. Julia Alekseyeva provocatively but persuasively argues that Princess Mononoke is a prolonged homage to the Soviet film The Snow Queen, which Miyazaki saw in his shop-steward days. Both Helen McCarthy and Alice Vernon argue for Miyazaki as a feminist storyteller, seeing in his work echoes of the Maid, Mother and Crone of Robert Graves and the “heroine’s journey” of Maureen Murdock, and in Vernon’s case, asking whether the pragmatic, driven Lady Eboshi is a threatening vision of what the future holds for the heroic San. Other chapters review cunning ruses in stunt-casting, not only of the film’s A-list voices, but of Neil Gaiman as the script adaptor, examining both the promotional value of these decisions and the nuances they introduced to the English-language version, the marketing of which is carefully analysed from the perspectives of posters, trailers and featurettes. Refreshingly, Denison has assembled writers who are not only prepared to dive into appreciations of the film itself, but overlooked elements as its critical reception (for which Emma Pett wades through over 800 reviews), and the long tail of its merchandise. The result is an impressive meeting of Princess Mononoke minds, although at £80 hardback and £55 on the Kindle, Bloomsbury seemingly lacks faith that the film’s much-mentioned blockbuster status will translate into a wide readership. Jonathan Clements is the author of Anime: A History. This article first appeared in NEO #173, 2018. This entry was posted in News and tagged anime, Japan, Princess Mononoke by ixarette. Bookmark the permalink.